This autumn we are bringing out six new filled chocolates, and one of them is lemon chutney chocolate (we’ve named it after the Indian city “Nadiad”). We are very excited about this particular chocolate, as this is one of the first collaborations we have with another artisan food producer, Dips. We met up with the owner of Dips, Hershil Patel. Hi Hershil, can you tell our readers a bit more about Dips? Dips is a family business. It was born out from me giving my mums homemade chutneys initially to friends and then to friends of friends. We received such a positive response from people we did not know that we thought we must be on to a winner. How do you come up with your lemon chutney recipe? And how different is it from other lemon chutneys? Our lemon chutney is the same lemon chutney recipe that we have grown up with since we were children. Back in the 70’s when my parents first moved to the UK it wasn’t possible to get all the foods that she was used to back in India so she adapted one of her Grandmothers recipes and hence the Nadiadee lemon chutney was born. 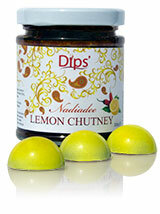 Our Lemon chutney is very different to those on the market. I think what makes ours extra special is that we allow the lemons to develop their own flavour. We preserve the lemons in our own blend of salt and spices and allow the flavours to mature for at least 3 months this gives a wonderful well rounded and special flavour. What food do you recommend having your lemon chutney with? Personally we eat this with everything. It is great with cured meats, ham and cheese. It can also be mixed with rice and couscous to make a fragrant side dish to eat with pan fried fish or chicken. You’ve helped us name this chocolate “Nadiad” - why have you chosen this city? Nadiad is a town in Gujarat which is north of Mumbai. It is a special place for us as it is where my mum grew up and I have visited it on several occasions now. It was the inspiration for my mums cooking and for that reason alone we had to name our first product after it. Our lemon chutney chocolate, together with 5 other new flavours, will be available from September 2015 onwards.